Compared to April 2016, new listings in the Twin Cities declined 8.3 percent while pending sales decreased 8.5 percent. Given that there were about 20.0 percent fewer homes for sale, a modest decrease in signed purchase agreements compared to last year reflects a shortage of listings and not necessarily declining demand. Days on market is still down and the number of showings per listing rose compared to last April. Buyers are still eager to purchase a home, but supply side constraints are weighing on sales activity. Those shopping for homes have 10,916 properties from which to choose in the metro area, the lowest April reading since 2003. Low supply and high demand environments tend to drive prices higher. The median sales price rose 6.3 percent from last April to $245,500. Multiple offers on updated, turn-key properties are common in low inventory environments. Properties also tend to sell quickly and for close to or above list price. Average days on market until sale fell 20.5 percent to 58 days compared to 73 in April 2016. It’s worth noting that the median days on market for April was a brisk 21 days—a 10-year record pace. The average percent of original list price received at sale was 99.2 percent, 1.2 percent higher than last year. Similarly, the median percent of original list price received at sale was 100.0 percent, meaning half the sales closed for less than full list price while the other half closed for over list price. The Twin Cities has only 2.2 months of housing supply—the lowest April reading since 2003. Generally, five to six months of supply is considered a balanced market where neither buyers nor sellers have a clear advantage. A healthy and diverse local economy has been conducive to housing recovery. The most recent national unemployment rate is 4.4 percent, though it’s 3.8 percent locally. The Minneapolis–St. Paul region has a resilient economy with a global reach, a talented workforce, top notch schools and a quality of life that’s enabled one of the highest homeownership rates in the country. The average 30-year fixed mortgage rate has declined from 4.3 percent to 4.0 percent lately, still well below a long-term average of about 8.0 percent. Excluding any surprising data or events, the Federal Reserve is likely to increase their target federal funds rate at least once more this year. Wage and inventory growth are key to offsetting affordability declines brought on by higher rates. 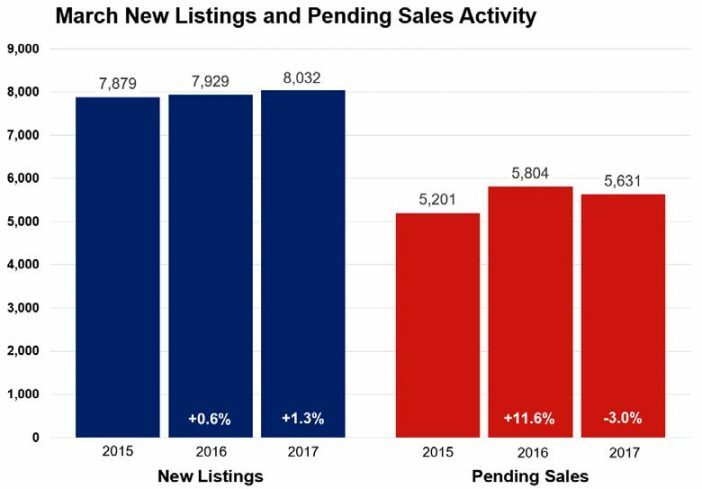 With both inventory and months of supply struggling to keep up with demand, it will not be unusual to see some weeks where pending sales post a year-over-year decline, especially if new listings droop below the standards set during the prior year. Meanwhile, we can continue to expect to see sales prices forge their way upward and affordability shrink downward in what is expected to be a pleasant spring and summer for sellers.